I’d like to take a moment to talk about the Muppets. I geek out about a lot of things, but absolutely nothing compares to my love of the Muppets and Jim Henson. To give you an idea of my Muppet/Henson love, I have more Muppet memorabilia than either my bank account or my age advise for. I cry EVERY. SINGLE. TIME I hear “The Rainbow Connection”. I even occasionally cry when I play “Being Green” on the guitar… makes it difficult to sing along, but I manage to sniffle between the verse and the bridge. 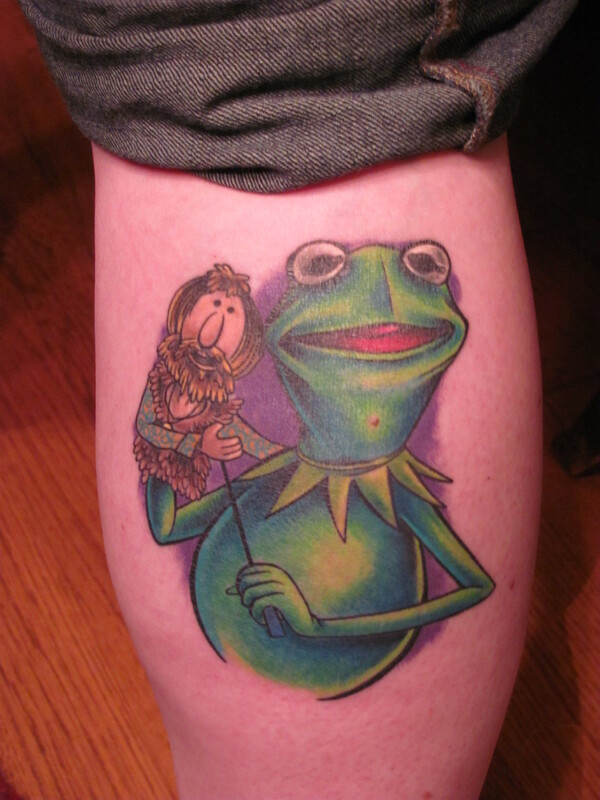 I even have a tattoo of Kermit and Jim on my right calf – AND IT IS AWESOME – See? The Muppets and Jim Henson have been a part of my life for my entire life. Like most kids growing up in the 1980’s it started with Sesame Street, then came Fraggle Rock, and re-runs of The Muppet Show. I enjoyed seeing The Great Muppet Caper on the big screen (even though Animal scared the freakin’ life out of me with the MGM Lion parody at the beginning), followed by The Muppets Take Manhattan, and I finally caught up to the original when my parents rented The Muppet Movie to watch on our Betamax. Yep, Betamax. Also enjoyed on Beta tapes were The Muppet Musicians of Bremen and The Frog Prince. I still haven’t seen Hey Cinderella!, but I’d love to. I remember being fascinated by The Dark Crystal and Labyrinth, and mesmerized by The Storyteller and The Jim Henson Hour. And then it stopped. Jim Henson had died. I remember being sad but, I don’t think I cried. It hadn’t hit me yet. At the time I was too young to really understand how profound a loss to the world Jim Henson’s death was. I remember watching The Muppets Celebrate Jim Henson, knowing that when Kermit finally showed up onscreen, when he opened his mouth, it wouldn’t be Jim’s voice anymore. It was weird. As an adult looking back, I feel so bad for Steve Whitmire (the puppeteer who has been performing Kermit since Jim passed) it was his first time behind (or under) the iconic frog and he hadn’t quite nailed the voice yet. By the time The Muppet Christmas Carol opened in theatres, Steve had gotten a lot better at Kermit and it was easier to accept the “new” frog… but the pang in my heart was still there. I didn’t realize until I was an adult just how deeply Jim Henson had affected my life. His gentleness, his persistence, his creative genius influenced the person I ultimately have become. Wow, I got deep really fast, huh? I warned you gushing was a likelihood. It has been an utter, squee-inducing, joy to see the Muppets back, and back with a vengeance! Not only are they back, but they are making a much-needed return to the sweet, irreverent, chaotic humor that was their wheelhouse back when Jim was around. Huge props to Jason Segel for being as much a Muppet fanboy as was needed to get the Muppets to “right where [they] belong”. He and Nick Stoller are the brains and the talent behind this new re-boot simply titled The Muppets. This movie looks like a dream come true for Muppet maniacs like me, and new potential fans alike. I mean he even included Thog!!!1!! Thog! 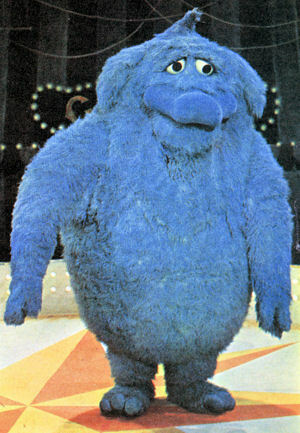 Big, blue, gentle, wonderful Thog!! Who else remembers Thog?? When I saw Thog in one of the early parody previews this year I just about wet myself. It was embarrassing, but also speaks to my inhuman level of excitement. Thog isn’t even my favorite Muppet but – OMG SQUEEEE!!1!!1! Wonderful, Huggable, Sweet, Gentle, Thog. The movie opens (as I am sure you are ALL aware) Thanksgiving Day. My wife will be there. Dinner will just have to frickin’ wait – I’ve got a Rainbow Connection to catch. ***P.S. I didn’t do the unicorn sketch – anyone know who did so I can credit them? I don’t normally write book reviews, but why not? I’ve been catching up on some great “nerdy” books of late and it seems like something to share. My favorite recent book purchase by far is Ready Player One by Ernie Cline. As a child of the eighties this book is glorious. All of the pop-culture references left my nerdy little brain “squeeing” with joy. The best part is that all of the eighties trivia matters to the plot and isn’t just there for fun. Although it is totally fun. Certain chapters left me on the edge of my seat, reading as fast I could to get to the next page and the next – the true definition of a page-turner. I had so much fun reading this book, I’ve already read it again – twice. The premise of the story centers around finding a very, VERY, valuable Easter egg in the world’s largest online game, and the lengths people will go to find it including using slavery and murder (these would, of course, be the bad guy’s methods). Crazy, huh? But so much fun! Read it! I also picked up a copy of The Nerdist Way by nerd overlord Chris Hardwick. This is more of a self-help book and I must admit, it does help if through no other way than by offering positive affirmations for us geekier types. The book is basically Chris saying, “This is how I live my life and it works for me. Take from it what works for you and have fun.” I do recommend this to anyone (especially any nerd) who is feeling stuck in a rut and needs a little direction to help with the unsticking. A lot of what Chris has to say is common sense put into action. He does offer some incredibly helpful advice, including step by step directions on how to fix your credit if you’ve screwed it up. Speaking to this section specifically: I should warn readers to remember that Chris does make at least a six-figure income, so it was easier for him to pay off debts and get his credit back on track in only few years, where it would take most folks in more typical lower-income brackets twice or even three times as long to do the same. But this aside, the book is a quick-read and full of great ideas and positive affirmations. Highly recommended. I know that I’m probably just preaching to the choir on this series as I am sooo very late getting to it (the first book was published in 1996). But for those of you who haven’t read them, get thee to a Barnes and Noble (or your local, non-corporate, bookstore) and devour them with your eye-holes! And just in case you’re wondering, no, I haven’t seen the TV series because we don’t get HBO, but I am totally looking forward to getting the DVDs! So that’s what I’ve been reading recently. What about you? Ok, so my post last week was about how I’d gotten myself in over my head with this year’s Halloween project. Did I successfully pull it off? YES! But, ultimately, for no one’s benefit but mine. There’s this new trend in Halloween celebrating called “Trunk or Treating”, and I don’t like it. I don’t understand current parents’ fears of taking their kids into neighborhoods to trick or treat. If it’s worries about “razor blades in apples” or “poisoned candy” it has been proven over and over and over and OVER again that these dangers are only urban myths. 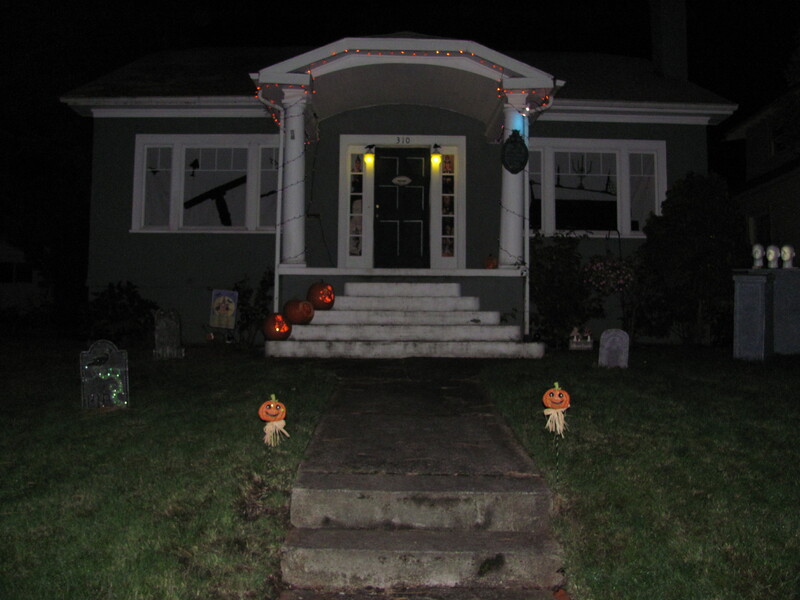 Halloween is the only opportunity many kids (and parents) have these days to meet and greet with their neighbors. 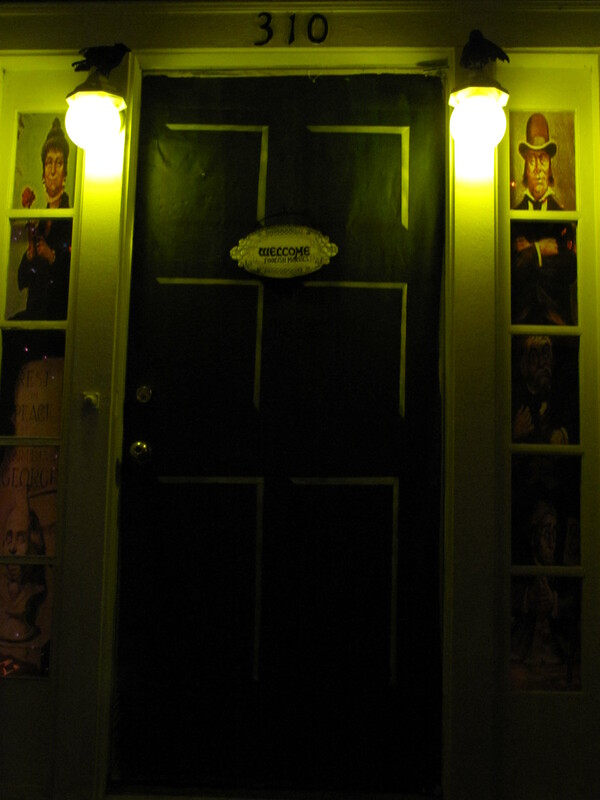 This latest pressure to drive trick or treating out of the neighborhoods and into church or community center parking lots under the auspices of “it’s just safer” is (IMHO) a huge mistake because then not only are the kids missing out, so are folks like me and my wife who go all out on interactive Halloween displays. 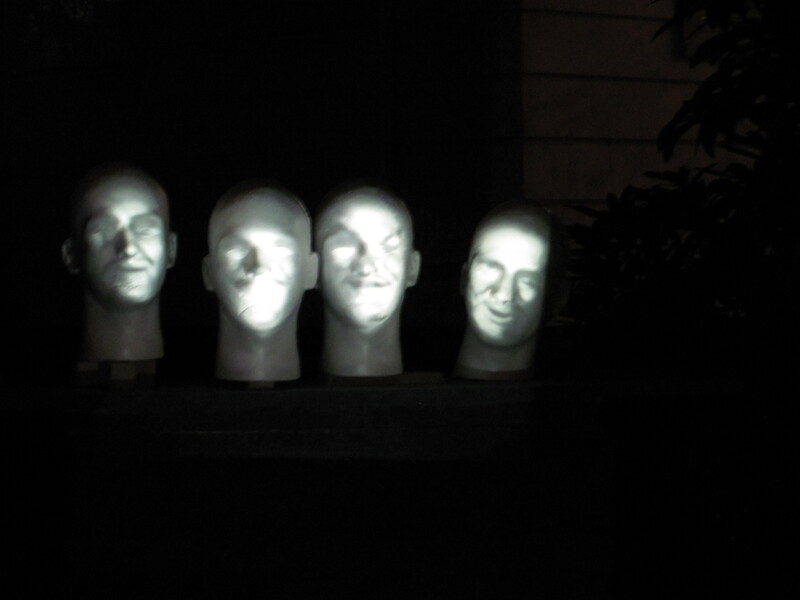 I take great joy in crafting new effects for my display each year, but it’s not just for my personal amusement. So much of the fun comes from the reactions of the kids and their parents. 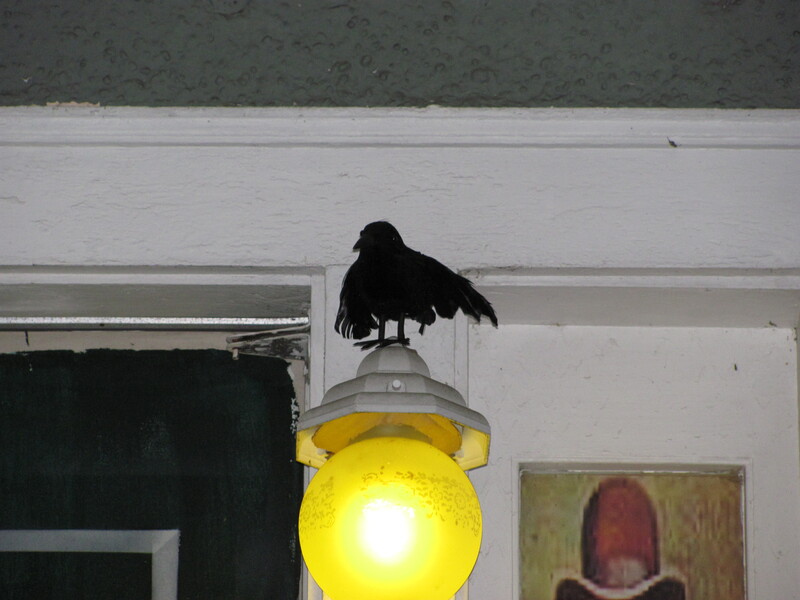 Maybe it’s just my neighborhood, you might say, and this may be true to an extent. 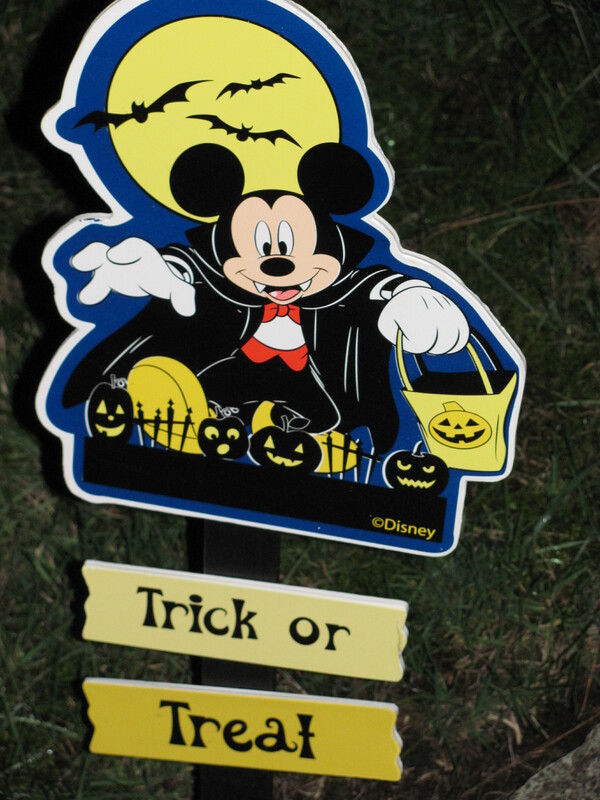 But we had three times as many trick or treaters last year as this year… and wouldn’t you know it, last year the church down the street didn’t host a Trunk or Treat and this year they did. I was initially hopeful that this would mean more treaters down our street. They’d go to the church, and then venture into the neighborhood to complete their stockpile of goodies. Could not have been more wrong. 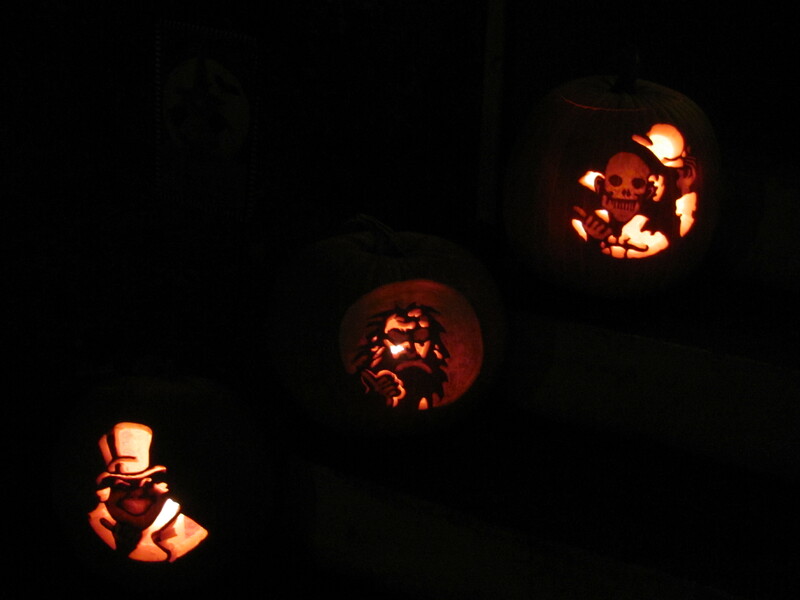 The Hitchhiking Ghost Pumpkins turned out GREAT this year! 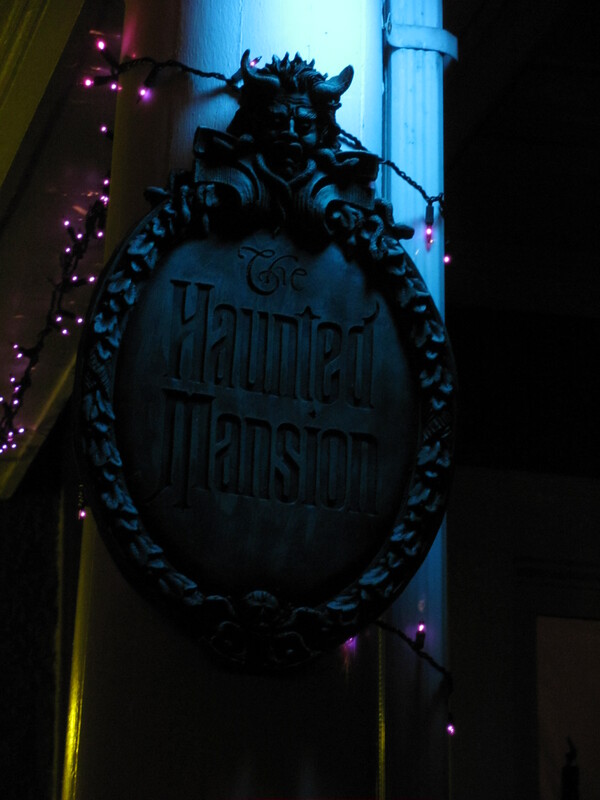 Is this haunted porch actually stretching? ?